Hello, My name is Lucila. Have you heard about Skulptur Projekte Münster? Artists are invited to present sculptures in public space. The Skulptur Projekte happens every ten years since 1997 and this is the 5th project. Can I show you my sculpture? How is your time today? This is the dialogue inside the performance, by Xavier Le Roy in collaboration with Scarlet Yu, initially proposed for Skulptur Projekte Münster as Still Untitled. The project works with the notion of sculpture in the body and invites the public to be part of the experience. For this, the artists proposed a series of workshops: #1 Embody Your Sculpture, #2 Make It Public and #3 Feedback Session, where anyone could sign up and participate. Led by the Still Untitled team, the workshops took place at Skulptur Projekte Münster in 2017, but the project is still alive and open for other developments. I had the opportunity to attend the first two workshops in the city of Münster. The third - Feedback Session - I presented, in the form of a text, because I could not participate in the talks. Conversations, incidentally, seem to be an important issue in Xavier Le Roy's work. Reflections and dialogue with the public compose many of his performances. The proposal launched at the first workshop of Still Untitled focused of the group toward preparing to embody our sculptures through a discussion of perceptions of space and time. Walking through space and recognizing the other through encounters, such as establishing a formal dialogue or holding the gaze of the other in silence, were the first possibilities presented for approaching the people who were there. After dividing into small groups, the conductors of the workshop, launched the proposal to choose a sculpture and to think about how we could reproduce it in our own body. Alexandre Achour who led our group explained: "It can be something simple, that is part of your way, your everyday life. For example, I am from the city of Lion, France, and in my town there is a sculpture of a lion." He then showed us his movement until he reached his sculpture embodying his lion. So, in that short time, I had to select a sculpture to reproduce. But in my daily life, I thought, there are no sculptures. I live in the city of Florianopolis, Brazil, where I only see water, plants and cars. Then I remembered Rodin, Degas, Maria Martins ... and Richard Serra's Tilted Arc. This sculpture seemed interesting to me to think about its relationship with space. A horizontal arc that cuts the space by disturbing people's path. Richard Serra's Tilted Arc was exhibited at the Federal Plaza in New York from 1981 to 1989 and was removed after a legal dispute precisely because of the nuisance it caused. But why did I choose a sculpture I have never seen in my life? Perhaps because by activating my memory a repertoire of images was accessed faster than the perceptions with real experiences. Suddenly I was talking about image, sculpture and body in the same work. Then, it was necessary to think about how to incorporate this sculpture in my own body and also, not least, how to get in and out of my sculptural pose. What movements could be in this transition and how long should I remain static? The time of observation of the person/sculpture was a decision of the person performing the sculpture, giving them to choice to make it short or long, activating the perception of the subtleties that compose the relation with the other. The question of time, in fact, was significant and marked the conduction of the second workshop Make It Public, which proposed a new dynamic of dialogues with the question: How is your time today? It is worth remembering that these dialogues were always done individually, in the encounter between two people in relation to the movement in the space. Reflecting about time induced us to discuss contemporary problems such as the acceleration and modification of the relationship with time in the digital age, chronological or temporal time, traveling time and the enjoyment of time. These reflections brought to mind the notion of presence, an essential concept of the performance art. The relation with time in performance becomes even more debatable when the object of consideration is the idea of sculpture. When inviting Xavier Le Roy, who works with the body, to participate in a sculpture project, the notion of sculpture is put into check. The Skulptur Projekte Münster takes place every ten years, long enough for considerable changes to the concept of sculpture to accur between presentations. 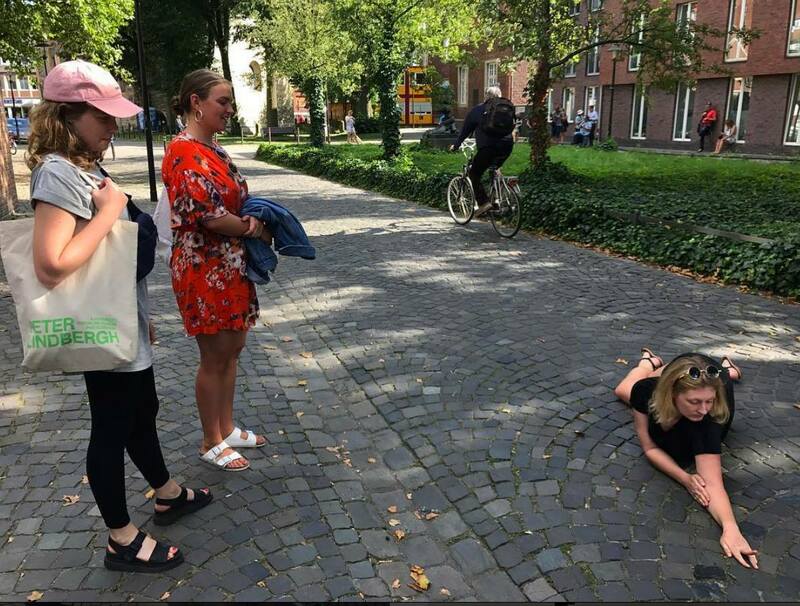 With a focus on art in public space, Kasper König, artistic director of the Skulptur Projekte Münster 2017, along with Britta Peters and Marianne Wagner, proposes not the occupation of art in urban space, but the creation of such spaces. The presence of performances, videos and installations in this event problematizes the reflection in the 21st century of sculptural thought. After practicing the dialogue about time, we return to think about our sculptures and work on their presentation. Make it public. How to expose this sculpture? How to perform it outside of our private space? At this point, the team of Still Untitled introduced to us the need to establish a frame for the work - a dialogue that marked the beginning and the end of the performance. This frame distinguishes of this performance in relation with street art. It would not be executed in urban space for the general public, but for a specific person. The individual presentation of this work and the establishment of a beginning and an end created a relationship of intimacy and trust with the person who was watching. The interaction between the performer and the person gave importance to the work, including the issue of authorship, which put the person's name in the final sentence as part of the project. This frame constructed through the conversation makes this proposal unique. The frame not only involves an image, but is related to it, is part of the look. And that dialogue provided that understanding. It was time to go to the streets. Outside, it was cold and rainy and we could only perform our work in an enclosed place. The choice was the LWL museum, where some works from the Skulptur Projekte Münster were exhibited. But it was in the opposite direction of the train station where I needed to catch a train that was scheduled to leave in a few minutes. I had to make a choice and went to the station, filled with curiosity and with the feeling of an incomplete experience. Gazing through the train window, I could only remember the question: How is your time today?